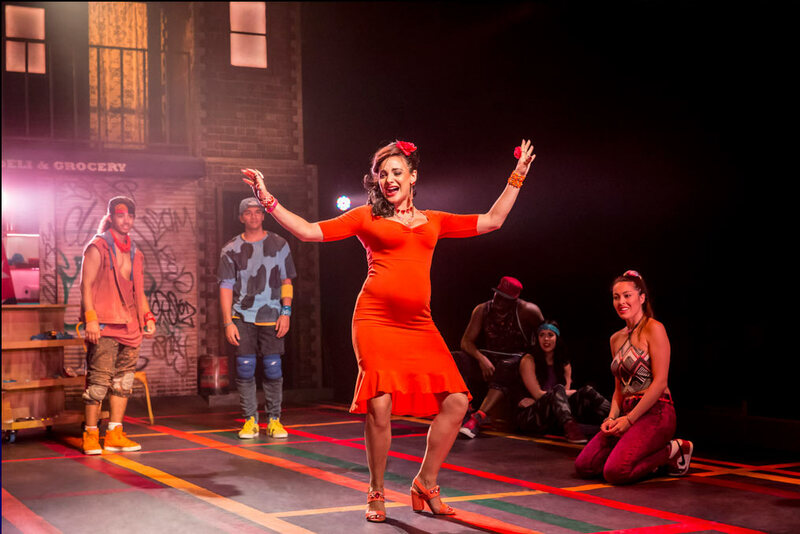 While music theatre fans across the globe wait to have the chance to see Hamilton, we still have the zesty, heartfelt pleasure of In The Heights to enjoy. First a word about the fabulous new Kings Cross Theatre. An easy two minutes’ walk from Kings Cross Station, the space was custom built for The Railway Children, which now shares the theatre in repertory with In the Heights. Impressively, the architects have avoided the number one complaint about theatres by including a wonderfully large foyer space with atmospheric lighting, thematic décor and a range of food and drink for sale. This is a place to relax and get in the mood before a show rather than a cramped space to hurry through. The performing space is a central strip between raked seating on two sides. With all the spinning in In The Heights, this layout is ideal. Set designer Takis has painted a colourful mural of subway lines on the ground, with constructed sets of the bodega at one end and the hair salon and car dispatch at the other. 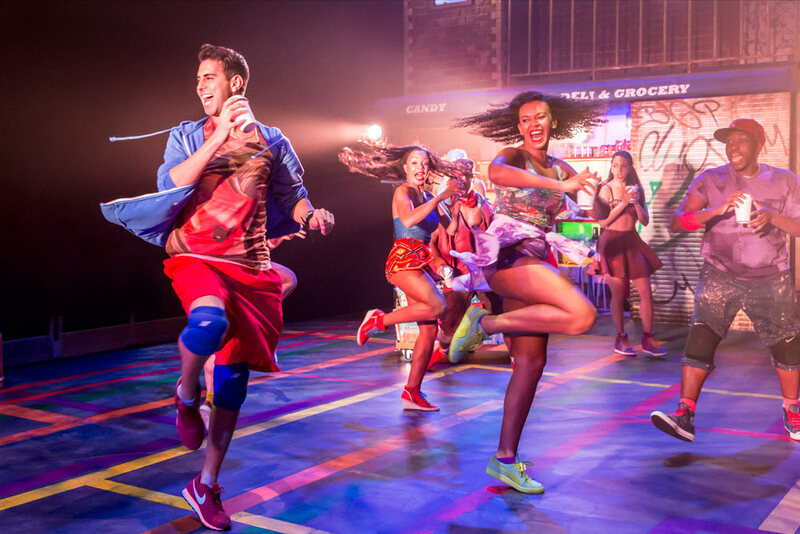 In keeping with the vibrant Dominican-American characters, the costumes (Gabriella Slade) and lighting (Howard Hudson) are festively colourful. The show can be criticised for the obviously telegraphed story developments, but there is ultimately a great deal of heart in the writing. Having an almost operatic structure, each character has their own aria ballad to express their inner thoughts and desires. In this company of incredible belters, these ballads are stunningly delivered, standing alongside the electric full company numbers without allowing the energy to flag for a moment. Director Luke Sheppard delineates the characters clearly and keeps the action swift and fluid while also delivering the warmth and soul of the piece. 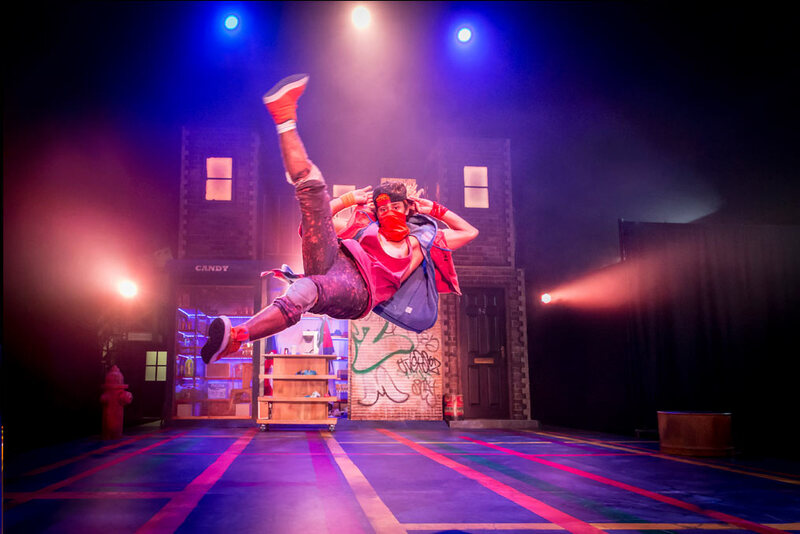 Drew McOnie’s intricate, high-octane choreography is great fun to watch. Full company numbers are a riot of strong vocals and exciting dance moves. Petite, short-haired Lily Frazer is a plucky, resolute Nina, and her soaring vocals are amazing. Playing salon owner Daniela at this performance, Philippa Stefani brings out a powerful belt in “Carnaval del Barrio.” Likewise, Jocasta Almgill, playing Vanessa at this performance, has her own lungs steel, as well as a charming stage presence. David Bedella is well cast as proud small business owner Kevin, achieving the requisite balance between paternal firmness and tenderness. Josie Benson, as Kevin’s frustrated wife Camila, delivers a searing performance of “Enough,” as Camila loses all patience with the squabbles and deceits of her husband and daughter. In The Heights is highly recommended viewing. Arrive a little early to appreciate the new theatre as well. 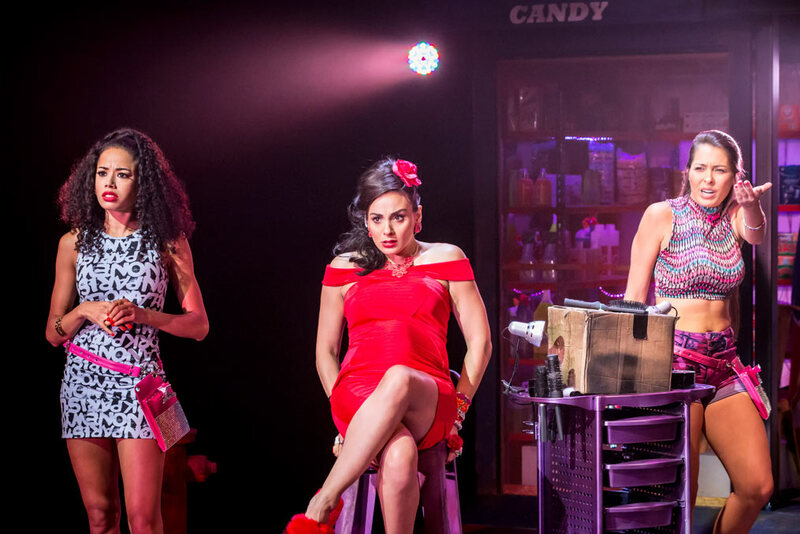 In The Heights plays at Kings Cross Theatre, London. 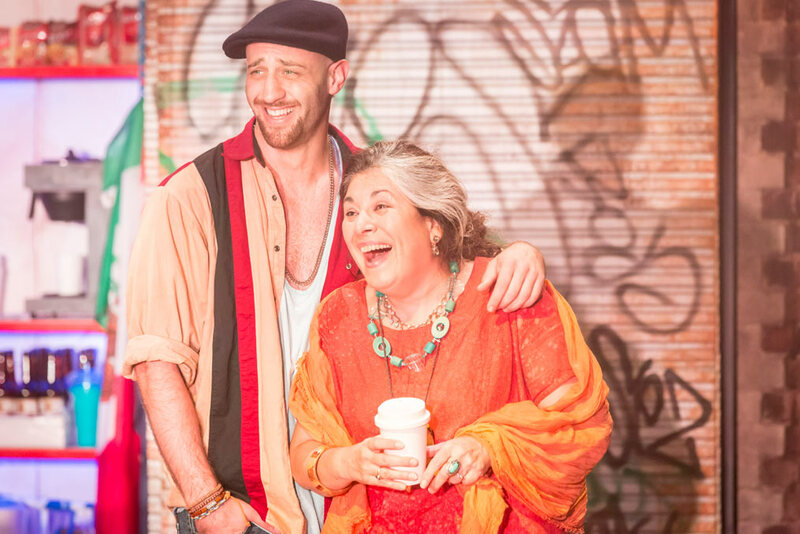 In The Heights was reviewed 6pm Sunday 24 January 2016. 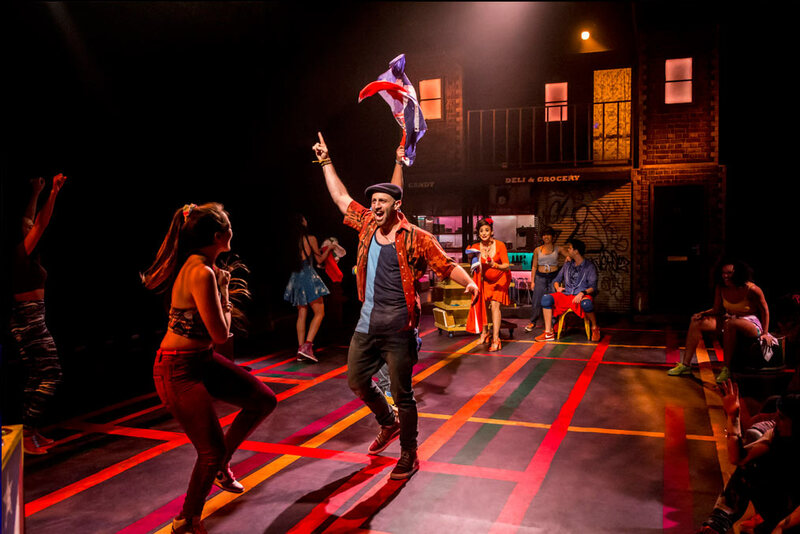 I’m really hopeful for a movie version of In The Heights before too long. It almost happened a couple of years ago, so I hope it is back on the slate again soon.